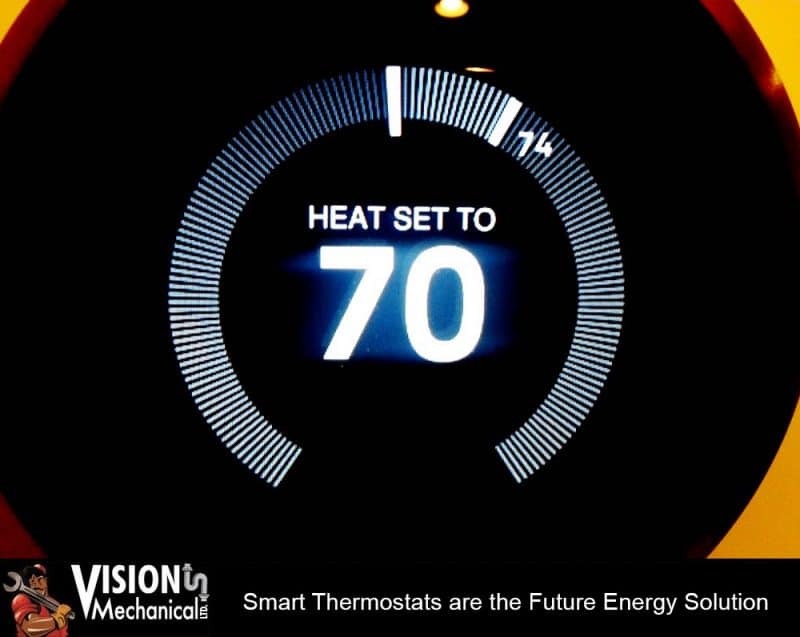 Smart Thermostats are the Future Energy Solution | Vision Mechanical Ltd. There are two kinds of traditional thermostats. One is the non-traditional type requiring manual input. The second is the programmable type, which offers a digital interface with time period programming. It automatically adjust the temperature based on time and allowing for multiple set points per day. Wi-Fi thermostats operate using the basic temperature setting, scheduling and digital interface options as tradition thermostats. The difference is the variety of added features. By using a smart thermostat, you can substantially reduce the power usage from the HVAC system. Some of these features include improved energy efficiency and feedback, remote programming, geo-fencing, and alerts. Smart Thermostats have an attractive look and aesthetically appealing to your home. As well, you can now link your thermostat to a Wi-Fi router and gain remote access by way of an app to your computer, tablet, or a smartphone. A thermostat basic function is temperature control. Make sure the smart thermostat is set up properly. Heating & Cooling Stages Check means the thermostat is compatible with multiple heating and cooling stages. Temperature Swing Changes triggers the HVAC to come on and off; make sure the thermostat has a high temperature change range and is programmable. Programmable Fan is an important feature if you are considering using it to cool your home. Scheduling and Vacation: Make sure you can program your thermostat to run at certain times. Have the ability to turn off while you are away for extended periods. Automatic mode and target temperature: Make sure that your thermostat can run automatically based on your use. As well the ability to calculate, how long it takes to reach your target temperature. Some Wi-Fi thermostats can use additional sensors to spread throughout your home. This feature provides more heat that is accurate or cool for your home. Zones: This is to focus specific temperature on different zones in your home. Weather: Some smart thermostats can pick up weather setting from the internet and adjust temperature based on the forecast. Status Indicators: A built-in diagnostics tool tells you if the system is running efficiently.